TIMEBOMB PART 3: Will Forgotten History Repeat Itself? This conference is being held at a time when we are at a crossroads in our efforts to rid the world of a killing addiction. In principle, the balance is entirely in our favor. In a perfectly sane, reasonable, rational world, with a level playing field, the anti-tobacco community would surely speak with the loudest voice and carry the biggest stick. Evidence for the physical harm, and economic costs, of tobacco use keeps growing.… We know that tobacco directly harms the user’s health in multiple ways. We know that tobacco products kill their consumers. We know that tobacco smoking, like a drive–by shooting, kills innocent bystanders who are forced to breathe air contaminated with hundreds of toxic chemicals. We know what tobacco exposure during pregnancy does to the fetus, another innocent, blameless, and entirely helpless victim. What changed over fifty years? Awareness, public outcry, and eventually changes in legislation caused bans to be placed on when and how tobacco could be marketed, determined who the target audiences could be, and implemented the requirement for warning labels on products to increase the buyers’ awareness of the dangers of tobacco use. It is now common knowledge that tobacco products are killing more than five million people per year. [iii] The risks and effects of smoking, both to the user and to those around them, have been disclosed to the public. Workplaces have either designated specific areas for smoking or declared that they are completely tobacco-free facilities. Pregnant women have been made aware of the risks that smoking cigarettes present to their unborn children. The dangers of secondhand smoke have been brought to the attention of parents. Programs designed to help smokers “kick the habit” are available at little or no cost in communities everywhere. The list of changes in attitudes toward and policies about tobacco use goes on and on, and it all started with people who identified a public health risk and took a stand against it. Now that the tobacco industry has been properly demonized and such products are no longer associated with such influential characters as those found on our kids’ favorite cartoons, we may not be surprised that the advertising industry has moved into using beloved animated characters to promote and endorse another dangerous addiction—children’s snacks: cereals, crackers, cookies, and more. The tobacco industry spent a lot of time dodging the real debate and paying scientists to claim their products were not dangerous. Eventually, however, the truth prevailed, and healthy changes began to take place. We are in a similar revolution now, with food at the center of the upheaval—but it cannot take place unless we are willing to fight. The longer we stand by and allow toxic foods to be marketed to our children, the more lives will be destroyed and lost. But, like those who fought for transparency regarding the risks of tobacco use, we can take a stand and push for changes in our food industry for the improvement of overall public health. Where Is the FDA in All This? By this time, we have made our point that most people feel their resources of time and money are spread too thin in one way or another to address the issue of diet. We’ve made a case for the psychological side of a shopper’s series of choices. But there is still a deeper problem that goes hand in hand with that first toxic ingredient in our food—our attitude toward it. This is the fact that when we have exhausted our own efforts, we often rest in the false sense of security that there is an agency looking out for our best interests. This is what causes many people to fall into the trap of hoping that a greater power is watching, regulating the food we purchase, and vetting out anything that isn’t safe to be consumed. For many, the mind reverts to those impressive visual banners hanging in the grocery store displaying the fresh food. Surely a benevolent power out there is regulating what is put into these arenas of food marketing. After all, where else would all this healthy food have come from? These officers act as our “protectors,” watching how produce is grown, how bread is baked, how nutrition labels are worded. “They” are believed by many people to act as a dietary guardian angel. People confidently believe that what is approved by the FDA falls under an umbrella of safety. You might be thinking: “Surely the FDA would never allow sales of dangerous substances. Why would it allow unsafe items to be sold to the American public?” The speculations as to why the answer to this question might be “yes” would fill another book, so I won’t go into that here. Instead, I’ll outline some of the history surrounding the introduction of GMO (genetically modified organisms) foods into the market. The Flavr Savr tomato case discussed in upcoming pages is one of many that shows the FDA is either overwhelmed, ambivalent, or nefarious (the reader may decide) in its operations. Regardless of the reasoning behind the FDA’s actions, it remains true that lethal ingredients, substances, and drugs are approved every day by the FDA. If you have trouble believing this, do a little bit of research on any common medication that comes to mind. A simple Google search of side effects of most common drugs quickly reveals that the substances are often as deadly as they are helpful. Food ingredients bring up an equal list of concerns—and, unlike prescription drugs, these elements aren’t even sold with a promise of somehow being medically beneficial. These risky food ingredients are merely added for flavor, visual effect, or preservation. WATCH THE FIRST TIMEBOMB PROGRAM! The point I am trying to make is that even if no conspiracy is involved (the reader may believe there is a conspiracy by the end of this book), by the FDA’s own admission, it is overwhelmed and simply cannot be everywhere, watching everything at the same time. Responsibility for our purchases and their nutritional properties ultimately falls on each of us. There is no “they” to protect us. Even purchasing from “nutritional” brands can be a slippery slope, as most are indeed owned by the larger food conglomerates. The illusion that there is an agency watching out for us, vetting the selections and acting as a discriminating gatekeeper for what is sold beneath the pictures of the garden-fresh, dripping lettuce in the produce section, is exactly that: an illusion. In the 1990s, Calgene Inc. introduced the first genetically engineered tomato: the Flavr Savr. This tomato took eight years and more than $20 million to bring about. Unlike previous tomatoes on the market, this new and improved tomato was designed to be picked ripe and last longer in this ripened state. Before now, tomatoes had been picked when they were green. Then they were shipped and treated to prompt ripening just before being displayed for sale in the stores. This industry practice prevented the stocking of soft, overripe, and “squishy” tomatoes on supermarket shelves. The Flavr Savr’s “softening gene” essentially had been disabled, resulting in a tomato that could be left on the vine until ripe, but would still stay firm throughout the shipping process. When the new product was released, Calgene responded to potential consumer concerns by labeling the tomatoes as a GMO product and even included an 800 number for calls with inquiries about GMO products. Calgene voluntarily underwent the FDA approval process for this tomato in an effort to be transparent and gain and maintain consumer confidence. During the FDA investigation, Calgene conducted three twenty-eight-day studies, which involved feeding the Flavr Savr to lab rats. To conduct this study, two separate but identical lines of the Flavr Savr tomato were created for the purpose of comparison to each other in a controlled experimental setting. Both lines included the same gene inserted into the same type of tomato. It is necessary to understand that the process of inserting the gene, followed by the cloning of the cell into the plant, can cause unique results each time, due to slight variations within the gene insertion and cloning procedure at the time it is conducted. This means the scientist can follow the same procedure multiple times, using the same materials, the same tools, and the same methods, yet end up with varying results. When the first study was conducted, each of the two engineered lines of the tomato was fed separately to two sample populations of twenty lab rats each. Researchers observed the rats for reactions to the specific tomato line that had been created and then fed to them. Initial reports showed that the twenty rats fed one of the engineered lines of tomato didn’t suffer any adverse effects. Of the rats fed the other type of tomato, however, seven of the twenty developed bleeding stomach lesions and tumors, and some died. These labs, which performed these tests at Calgene’s expense, noted that the results manifested possible “treatment-related” problems due to the appearance of the bleeding stomach lesions. Scientists within the FDA acknowledged that the tomatoes failed to exhibit “reasonable certainty of no harm,” which is the normal standard of safety determined by the FDA. The media blitz around the tomato was controversial: Some stories showed people proudly tasting the tomatoes and professing their confidence in the product, unfazed by the GMO status. Others were dubious. Argument in favor of the tomato’s approval was often heavily formulated around the emphasis that there was no scientific basis proving the tomato was unsafe. Arguments against the approval of the tomato and other incoming GMO foods dubbed them as “scientifically unfounded.” The issue was simply that no science existed on the products at all because they were brand new. The FDA’s official statement was that it would ensure that the biotech products were treated with the same safety oversight as other foods, without being hampered by unnecessary regulation. As a precaution, Calgene destroyed the line that had caused stomach lesions in the experiment subjects. When Calgene repeated the study, feeding the Flavr Savr tomato to thirty-five rats this time, there were only three casualties. During this testing, the tomatoes were administered in a freeze-dried form, allowing scientists to place the concentrated tomato into each subject. Willing to acknowledge that unresolved questions lingered, the FDA was pressed with the question: To approve or not to approve? It swept concerns regarding the tomato under the rug and deemed the tomato safe. But alas, Calgene openly admitted that while its scientists were trying to create a better food source, they were not skilled as agricultural grocery distributors. On the distribution end, they made so many mistakes that they couldn’t turn a profit with the new product. Eventually, Calgene was bought out by Monsanto. But if this tomato wasn’t profitable, why did Monsanto purchase the company? Could it be that Monsanto was trying to silence a competitor that was interested in transparency? The tomato has been removed from shelves, and the only place that the Flavr Savr tomato seed can be found today is in a Monsanto vault. Why? Could it be because Calgene had patents on key technology and Monsanto was anxious to eliminate a competitor who was calling for appropriate labeling and was dedicated to the kind of transparency that Monsanto wasn’t comfortable with? And, since Calgene was bought out by Monsanto, no GMO food manufacturer has been so forthcoming with research regarding its product and given such detailed reports as these to this day. This is the same type of process that would have been used in engineering the Flavr Savr tomato. When Dr. Pusztai reviewed the lab documents from the Flavr Savr tomato, he found many discrepancies within the initial report. What actually happened during the testing? The feedings were conducted in three twenty-eight-day segments. Allow me to recall your attention to the fact that two types of tomatoes were created for this experiment. The rats eating one of the types remained healthy and seemed to show no adverse effects. Dr. Pusztai had many concerns about the other type when reviewing these documents. The FDA’s explanation for the rats that died of bleeding stomach lesions was that these issues were caused by mucolytic agents in the tomatoes. According to Dr. Pusztai, tomatoes don’t even contain this agent. Other possible reasons cited for these lesions were restriction in the rats’ diet, but this is discredited by the fact that the rats were fed freely and ate as much as they wanted. Another named culprit was animal restraint, but the rats were not restrained. Finally, Dr. Pusztai came upon an endnote in the Flavr Savr research documents that had not been addressed: He found that seven of the twenty rats fed the troublesome tomato line had died within two weeks. The death of these rats had been dismissed as a husbandry error, with scientists deciding to blame the feeding method rather than the food for the lesion. It was said that an error in inserting the feeding tubes had caused the rats to be injured by “accidental administration of test material into the lung instead of the stomach.” But this explanation didn’t address how that would cause stomach lesions and tumors; logic says the error would have injured the lung instead. The FDA scientists’ own argument disproved their point. The doctor pointed this out, stating that certainly some of the rats that ate from the other tomato line would have died if the feeding method were the culprit. Again, this wasn’t the case. With no additional explanation documented, a further shadow was cast by his investigation when he realized these lab rats were simply replaced with new ones, and the whole incident seemed to have been swept under the rug. The doctor noted that lab rats are not supposed to be replaced with new, living ones when they die during experimentation. Due diligence suggests that the death should be investigated, and the experiment should continue with the remaining live subjects. Introducing new rats could compromise the entire outcome of the experimentation. Additionally, postmortem analysis should be part of the procedure, especially when the goal is to determine whether a food or drug is “safe” for human consumption. Some of the FDA scientists working on the study wrote memos saying that the rates of these lesions could not be discarded. Other scientists stated in their reports that these tomatoes fell below the FDA’s standard of safety, despite that its regulations clearly require that these and any other GMOs be held to the same standard as other foods being approved. The terminal lesions experienced by the lab rats were deemed by FDA authorities as “incidental,” and they decided these issues had nothing to do with the tomatoes. Some FDA scientists were doubtful, claiming that the ambiguity around this study was still too much, but they were within the lower ranks of authority and were outnumbered; their concerns were disregarded. In review, we started this look into the Flavr Savr tomatoes with two lines, or types, of tomatoes whose only variations were a result of the uniqueness that is unavoidable during the gene-insertion process. Out of one line, no rats died. Out of the other line, seven out of the twenty rats developed bleeding stomach lesions and died. This is a mortality rate of nearly 50 percent. If scientists were trying to advocate for making this tomato appear safe, one would imagine that there would have been a thorough investigation attempting to prove that feeding methods or lung damage were the concrete causes of death for these rats. This would have disavowed all doubt about the safety of the tomato. Instead, concerns were left unaddressed and ambiguous evidence dismissed; later, some of the scientists involved even tried to say that no rats had died. [viii] However, official reports documenting the process referred to “necroscopy data,” which indicates a study performed on a dead body, not dead cells. In addition to all of this, in trying to explain the deaths, some scientists’ defense became that tomatoes, when eaten in excess, can kill rats. That leads one to wonder why tomatoes had been tested on rats in the first place. On top of everything else, that still doesn’t answer the recurring question: Why did nearly half of one group of rats die, while there were no casualties from the other line? At this point, one would wish that the FDA had exercised more caution in the approval process. One would have hoped for a longer period of testing, especially in light of the percentage of rats that showed up with complications. Further concern about the research on the Flavr Savr tomato included the fact that the rats used varied in weight, meaning that there wasn’t a level playing field for gauging the animals’ responses to the tomato in the first place. With the FDA encouraged to promote public trust in biotechnology, the goal in approving the Flavr Savr tomato for sale to the public was surely to open the market to GMO foods. Investigations were essentially skimmed over, and concerns voiced by opposing scientists were ignored by the FDA officials in authority, who ultimately had the final say in whether this tomato was approved. This was the beginning of a radical change in the food-supplying history of the world. The product was put on the market with very little research, which opened the door to more products of its kind. Unfortunately, no after-market research was conducted on the people consuming these products. We care because this case proves that since the introduction of GMO foods into our supermarkets, we’ve had no confirmation that these foods are safe. On the contrary, study results have been ambiguous at best, and shady and conspiratorial at worst. This case shows that the first GMO experiment ever resulted in nearly 50 percent casualties for the lab rats that ate these products, and even indicates that since the introduction of GMO foods, the FDA and other powers that be have been disregarding risks to public health. For the sake of time and space limitations, we won’t go through the history of all the GMO foods available, nor will we outline the investigations into each case, although concerns and results are similar. This example should suffice to show that since the beginning, “they” have not been looking out for our best interest, and GMOs are abundantly available in thousands of the foods we eat every day. There has been an underlying agenda from the onset of the GMO movement, with a supreme goal of getting GMOs on the market and into our bodies. Furthermore, when this movement is met with resistance, the concerns voiced are condescendingly deemed as “holding no scientific merit.” Worse, scientists and others who try to voice concerns, like Dr. Pusztai, are ostracized, suspended, or otherwise silenced. NEXT UP: Dealing with the GMO Threat! 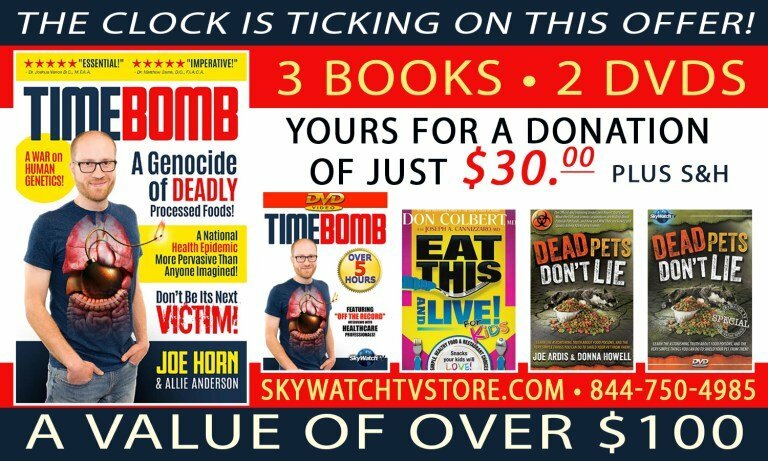 FREE BOOKS & DVDS WITH TIMEBOMB SPECIAL OFFER AVAILABLE FOR A VERY LIMITED TIME ONLY!! [i] Winston Cigarettes. “Flintstones Winston Cigarettes Commercial (Rare)” Created [1954.] YouTube Video, 1:20. Posted [19 June 2006.] https://www.youtube.com/watch?v=FqdTBDkUEEQ. [ii] Chan, Margaret. “The Changed Face of the Tobacco Industry.” World Health Organization, 20 Mar. 2012, http://www.who.int/dg/speeches/2012/tobacco_20120320/en/. Accessed 18 Dec. 2017. [iv] Bovay, John. “FDA Refusals of Imported Food Products by Country and Category, 2005-2013.” United States Department of Agriculture, https://www.ers.usda.gov/webdocs/publications/44066/57014_eib151.pdf?v=42457. Accessed 18 Dec. 2017. [vi] Roseboro, Ken. “Arpad Pusztai and the Risks of Genetic Engineering.” Organic Consumers Association, 1 June 2009, https://www.organicconsumers.org/news/arpad-pusztai-and-risks-genetic-engineering. Accessed 18 Dec. 2017. [vii] Smith, Jeffrey. “Throwing Biotech Lies at Tomatoes—Part 1: killer Tomatoes.” Huffington Post, 31 Dec. 2010, https://www.huffingtonpost.com/jeffrey-smith/throwing-biotech-lies-at_b_803139.html. Accessed 19 Dec. 2017.